Heaven, as a sacred place or a state of being, appears in the myths and legends of cultures around the world. It can be the dwelling place of the god or gods, the place where people who have lived virtuously find their reward after death, or both. Heaven has often been described as a paradise of some kind, located above or beyond the limits of the ordinary world, perhaps high on a mountain peak or floating on a distant island. For example, the Hottentot god Tsuillgoab lives in a beautiful heaven in the clouds. Over the centuries, traditional ideas have changed, and many people now think of heaven more in terms of a state of spiritual existence or salvation than as a precise though otherworldly place. Heaven, described as a sacred place or paradise, appears in the myths and stories of cultures around the world. 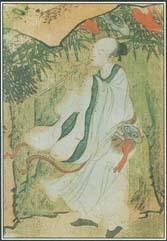 This silk painting shows an immortal being playing the flute in the Taoist heaven. Buddhist View. A version of Buddhism based on Amida or Amitabha, the Buddha of Boundless Light, emerged in Japan in the 1100s. Followers of this sect believed in an eternal afterlife in a realm called the Pure Land or the Western Paradise. Anyone could enter the Pure Land through sincere spiritual devotion to Amida, who taught that the road to salvation lay in saving others from suffering. Other versions of Buddhism described the soul's ideal fate not as arriving in a heaven but as achieving nirvana, a state of being in which individual desires have ceased to exist. Chinese View. Traditional Chinese religion and mythology included multiple concepts of heaven. Tian, associated with the sky, was both heaven and a deity who was the supreme power over gods, men, and nature and the source of order in the universe. The Chinese believed that their rulers' authority came from Tian, and they called their king or emperor Tianzi, Son of Heaven. The Taoist tradition of Chinese mythology spoke of Penglai Shan (Mount Penglai), a mountain with eight peaks. On each was perched the palace of one of eight immortal beings. Like many heavens, Penglai was described in terms of precious things: it had trees of coral that bore pearls instead of fruit. No human could enter Penglai because it was surrounded only by air. Pre-Christian European View. Before Christianity became the dominant religion of Europe, pagan cultures had various ideas about the dwelling places of the gods and the destinations of human souls after death. Some of these are comparable to heavens. In Norse* mythology, for example, the gods lived in Asgard, the topmost realm of existence. Like the human world below, Asgard had farms, orchards, and estates. The souls of heroes who had died in battle went to Valhalla, the "hall of the slain," where they spent their afterlife in joyous fighting and feasting. Myths of the Slavic peoples of eastern Europe mentioned a paradise called Buyan, described as either a silent and peaceful underwater city or an island washed by a river of healing. The Celtic* peoples had myths of an island paradise called Avalon. Some legends say that King Arthur was carried there after he fell in battle. The Greeks imagined their deities as dwelling in a palatial heaven high above the mortal world on Mount Olympus. The blessed dead, however, went to Elysium, or the Elysian Fields, a green gardenlike afterworld. Jewish View. The ancient Hebrew religion featured an afterlife, but it did not include a heaven or a hell. By about 200 B . C ., however, the influence of other cultures had introduced the ideas of reward and punishment after death. Heaven came to be seen as a place where the righteous dead would dwell with God. Certain Jewish traditions pictured heaven as a mountain with seven tiers or layers. According to some accounts, King Solomon's throne, which had six steps leading to the throne itself, provided the model for the structure of heaven. Christian View. The Christian idea of heaven is based on the Jewish one. Although modern Christians are more likely to interpret heaven as spiritual union with God, earlier generations of believers placed that union in a physical setting that was often described in great detail. In the early 1300s, Italian poet Dante Alighieri created a vision of heaven in the Paradiso, the last section of The Divine Comedy, a long allegory about the soul's journey. Drawing on both Christian and pagan traditions, Dante portrayed paradise as high above the earthly world. It consisted of nine heavens, one inside the other, rotating around the earth. The tenth heaven, which included all the others, was the destination of blessed souls who were ranked in order of their virtue, the more virtuous being closer to God. Artists and writers of the Renaissance developed three visions of heaven. The first, the realm beyond the skies, was the source of images of heaven as a place of clouds and winged angels. The second, the garden of paradise, was the natural world raised to the level of divine perfection—an image associated with the Garden of Eden, the lost paradise that once existed on earth. The third vision was that of the heavenly city, a symbol of perfect organization and harmony. The idea of heaven is bound up with that of eternal life. Descriptions of many heavens make a special point of mentioning immortality, whether of the gods or of human souls. In the Norse Asgard, for example, the gods guard a precious treasure—the golden apples of immortality. The apples of eternal life also grow on the Celtic island of Avalon, a name that means "apple isle." In Penglai, one of the 108 different heavens in the Chinese Taoist tradition, the Dew of Eternal Life flows through streams and fountains, offering immortality to anyone who drinks it—but only insects, birds, and the gods can ever reach Penglai. Islamic View. Building on earlier Jewish and Christian traditions, Islamic mythology also envisioned a multilayered paradise. Heaven was a pyramid, cone, or mountain rising from the lowest level to the highest. Some interpretations include eight levels, some seven. The phrase "seventh heaven," meaning the highest happiness, comes from this image. The Muslim heavens are garden paradises of shade trees, flowing streams, and abundant pleasure. The various levels are associated with precious substances such as gold, silver, and pearls, but the highest level is made of pure, divine light and is devoted to the ceaseless, joyous praise of God. See also Afterlife ; Angels ; Avalon ; Eden, Garden of ; Elysium ; Hell ; Valhalla .